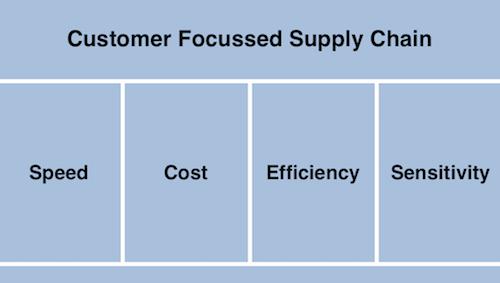 Home/Supply Chain/Customer Focussed Supply Chain ~ An Emerging Trend! 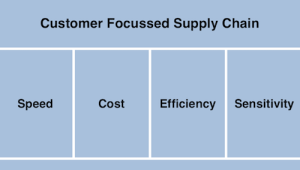 As Peter Drucker, famously said, “The purpose of any business is to create a customer.” As the focus from Supplier is shifting to Buyer, the Businesses today are realising that that in order to be successful in the market place, they need to strengthen the Customer-Focussed or Outside-In supply chain model. Outside-In supply chain cannot be successful if the bridge between the Enterprise and the Customer continues to be manual and slow. As a result the corporations, which are largely driven by Enterprise Focussed supply chain, have to transition themselves into customer focussed platforms where information from customers can be sensed through the platform and ploughed back into the system to enhance the speed of delivery and the overall customer delivery experience. This trend has started showing especially in E-commerce supply chains and would soon follow in other segments B2B supply Chains. The overall customer delivery experience would take into account these four critical elements ~ Speed, Cost, Efficiency and sensitivity. And these elements are an outcome of a mix of strategy, technology, people and systems. In an environment of continuous change, a right combination and a strong coordination among these parts will create an agile and responsive supply chain which, ultimately, will enrich the consumers. As markets are changing from predictable demand state to highly unpredictable demand state, a fully integrated supply chain is the need of the hour. But the understanding of the subject within the practitioner’s fraternity is limited. People and organisations are busy operating in their silos. But this operating style may not sustain itself for longer especially in a customer focussed era. There exists a great deal of opportunity at every level for deployment of right technology. Whether it is the collaboration with the customers and partners or re-hashing delivery models, Technology is helping organisations in creating a unified network and bridging the gap between demand and supply. Technology is not only enhancing the efficiency of Supply Chains, it is also enhancing the speed of delivery and making it more responsive. Analytics is becoming instrumental in identifying de-coupling points for organisations. This will go a long way in enhancing the overall delivery experience to the customer. However, right set of people would have to be inducted to create and implement this change. And as a start, a great deal of shift in the thought process of the organisations would be required to effect this overall change.